Both feet balanced on the narrow runner, my mitten-covered hands clenched the hoop on the back of the sled. Inside the thick lining my fingers shook. Not from cold, since the temperature wasn't much below zero, but from anticipation. The excitement of the dogs paralleled my own, as they lunged forward into their harnesses, anxious to be moving. Ellen huddled under the comforter in the basket of the sleigh, while Dave, our musher, stood less than a foot away, facing me on the opposite runner. We were ready! Dave yanked the brake from the snow, pushing off with one foot as the sled began to move before he even gave the command. The wheel dogs, bearing the burden of getting us moving, strained into their harnesses, happy to be starting out. It didn't take me long to get the rhythm of sledding - to feel the sway of the sleigh and make it my own. The whoosh of the runners over the snow was as soft as the new-fallen snow, as constant as the endless blue in the sky over Churchill, Manitoba. I'd long dreamed of visiting Churchill; after all I'd been listening to my father's stories of its wonders my whole lifetime. He'd spent time on the Churchill Military Base in the 1950s before moving on to the logging camps of the north. Earlier in the day I'd even had an opportunity to visit the Churchill Northern Studies Centre, which occupies some of the original buildings. Unlike Ellen, my southern friend, I was already used to the wonders of winter, but Churchill was even more than I expected. It was white - not the white of the prairie landscape - but a pure, vast white. I stepped back into childhood, to winter afternoons when the whole world was my backyard of new-fallen snow and I couldn't imagine anything more. My adult view of winter snows, tinged with blow dirt and grime, disappeared in the untouched landscape of the north. Dave called, "Gee," and the lead dogs swung right, taking us off the packed trail. The snow was soft, and shallower than I'd expected. It was more of a winter desert, with a wind constantly remaking the horizon most days. But today I was lucky - there was no breeze at all. The eight sled dogs, Dave explained, all had different roles to play. 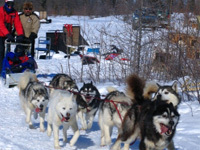 The head or lead dogs provide direction, while the swing or pointer dogs come next to help turn the sled to follow their lead. At the back, next to the sleigh, the wheel dogs take the weight of the sled, while the team dogs between them and the swing dogs work to set the steady pace that keeps everything rolling along. One of Dave's wheel dogs was in training, so we stopped several times to reward its good behavior with affection and attention. Whitley, one of the team dogs, also received quite a bit of attention as Dave worked to restore his faith in people. Whitley had been an abandoned race dog Dave brought home. Sled dogs are generally a mix of breeds known collectively as Alaskan Huskies. Before leaving town I'd seen puppies in training tethered on a line that kept them in close proximity to one another, while providing a chance to lie in the sun. Northern bred, born, and raised in some of the harshest conditions in the world, the huskies are tough. Their thick double coats protect against the cold and wind; plus they have large hearts and lungs for stamina, tight feet for hours on the trail, and most important, love to run. Dave's dogs were voice trained, so they responded to his commands, rather than having reins to drive horses on a farm. "Go ahead," Dave said, grinning, "steer for a while." I called, "Haw," and watched them turn left in the snow. The sled tipped a little as we hit an uneven spot, and I leaned to compensate automatically. This was fun! "Me?" I shook my head. "Not a bit!" I was having way too much fun to consider stopping yet, so we continued following the trail the dogs trained on. Dave's dogs were touring dogs, not race dogs, so we could enjoy a more leisurely pace, taking in the scenery. An Arctic hare, its white fur blending into the surroundings, hopped out of one of the sparse stands of short pine, surprising us. The Rock Ptarmigan, with their black feet, had been easier to pick out the day before on the ice of Hudson Bay. Indeed one of the most beautiful things I encountered had been the ice hummocks on Hudson Bay the day before. Technically, hummocks are pieces of broken ice forced upwards by pressure, but artistically they are better described as glittering ice chunks piled haphazardly over one another, creating geometric anomalies that catch and reflect sunbeams in unimaginable ways. They stand as nature's art forms on a frozen canvas. 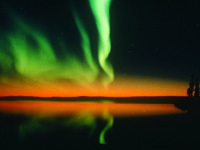 By night, Churchill's Northern Lights are one of nature's wonders that have fascinated people since the first Inuit storytellers. I'd gone out in the Tundra Buggy the evening before, leaving the few lights of civilization behind to get the best view of the night sky. The Northern Lights shimmered and bounced overhead; the glow starting at the palest green and becoming brighter as they danced. I hoped my coming evening, at the Aurora Domes, would be just as beautiful. I could have gone dogsledding all afternoon, but of course, my itinerary had other planned stops: the Eskimo Museum; snowmobiling out to Fort Prince of Wales, which had been completed in 1771 by the English to protect their northern claim, then taken by the French in 1782 without firing a shot; and of course, some shopping for treasures created by local artisans. Back in Churchill I gazed out at the landscape, my newly-trained eye able to pick out the tree line on the horizon. I knew it would take more than one trip to discover all there was to Churchill.